“At the beginnings of your months you shall present a burnt offering to the LORD: two young bulls, one ram, and seven lambs in their first year, without blemish…” (Numbers 28.11). You can see the offering included seven lambs in their first year. Why did the Lord want seven lambs? I do not know that the text reveals the reason for that number, except that we find throughout the word of God, His desire for seven. 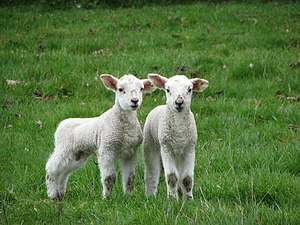 If the Israelites did not understand the reason for seven lambs, should they have disregarded the command? They still should have offered seven lambs in obedience to God, because obedience means we have confidence in Him that He knows what is right and that He knows what He is doing. Do you have that level of confidence in God that you will obey Him, even if you do not always understand the reason for the command? This entry was posted in Lamb, Numbers, Seven and tagged book of numbers, burnt offering, confidence in god, God, Israel, Israelite, Lord, New Year, obedience to god, religion, sevens in the Bible, Sheep, theology. Bookmark the permalink.